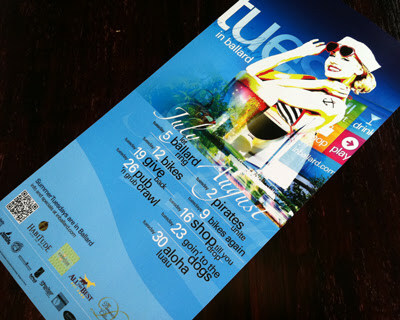 Design Hovie Studios has created the new brand for Watson's Alpenhorn Cafe in Chelan Washington. The historic Alpenhorn was originally opened in 1967 and has become a mainstay on Lake Chelan under various different owners. 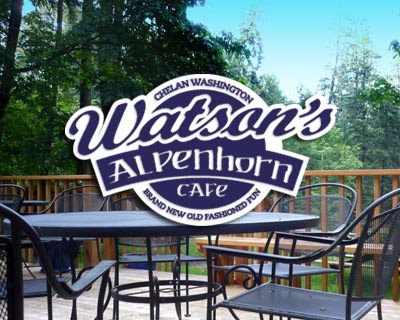 The cafe was recently purchased by Watson's Resort and renamed Watson's Alpenhorn Cafe. Watson's asked Hovie, who created the Watson's resort logo, to create a new brand that incorporated the existing Watson's brand with the old time Alpenhorn look. Since nothing but old signs existed from the original Alpenhorn look, Hovie created the Alpenhorn typeface by doing tracings of the old signs and combining that type with the familiar Watson's script. 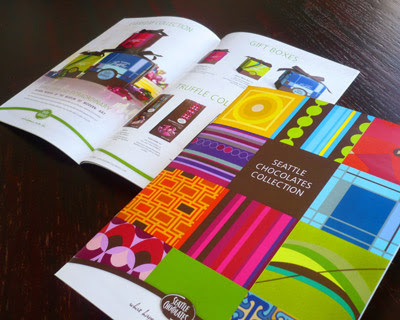 Design Hovie Studios has designed the new catalog for Seattle Chocolates. The new catalog includes the Seattle Chocolates line as well as the company's Chick Chocolates and JTruffles brands. The design of the 20 page piece utilizes the many colorful, fun, and exciting patterns Seattle Chocolates uses in their packaging.